So as we continue this series on the future of classical music, we’re trying to get our head around the basic question: why do people like or dislike certain types of music? 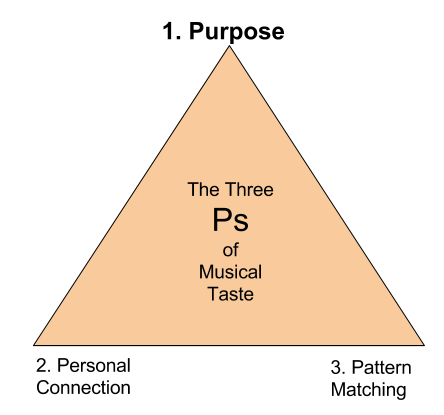 I suggested in my last post that there seem to be three main factors that come into play as to why people like some music and not others: Purpose, Personal Connection and Pattern Matching. The three are tightly connected – there might be music that ticks one of those boxes for somebody, but not two of the others. So no one factor by itself is enough to explain why someone likes a certain type of music. 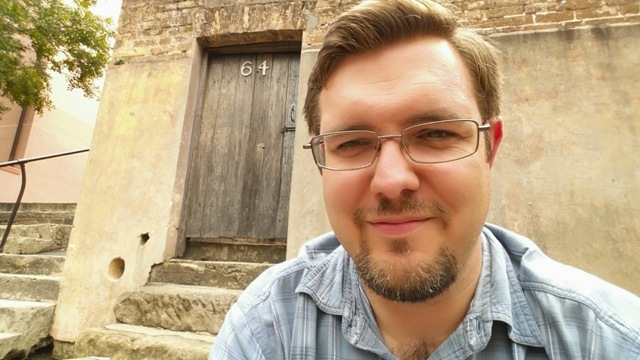 So as you read this post, you may be saying, ‘Well, Purpose might be part of the reason why somebody doesn’t like classical music, but it’s not the whole thing.’ That holds true for any one factor. But understanding them first as separate factors helps us work out some of the different problems that people might have with classical music. Then (hopefully!) when we put all three Ps together, everything will make more sense. This first P in the Three Ps of Musical Taste (or Musical Liking, as I often like to call it) is, to me, the most basic one. If a person can’t find a valid purpose for listening to music, then you’re unlikely to make them a fan. What exactly do I mean by purpose, though? Well, here’s where things get a bit fuzzy. There is no standardised list out there of ‘Purposes for Listening to Music’. In fact, it’s one of those things that everybody from academics and philosophers likes to debate without necessarily arriving at definitive answers. However, being a pragmatist at heart, I’m mainly interested in how the average person on the street would describe why they choose to listen to a piece of music. So for my money, one of the best summaries of the main reasons people listen to music, came from this article from 2011 in Psychology Today (which got it from an older study from 2007 which sadly has a broken link). How is it then that our musical preferences come to reveal our inner thoughts and feelings? The answer is really quite simple, namely that music fulfils three important psychological functions. Indeed, scientific research shows that people listen to music in order to: (a) improve their performance on certain tasks (music helps us combat boredom and achieve our optimal levels of attention while driving, studying or working); (b) stimulate their intellectual curiosity (by concentrating and analysing the music we hear); and, most importantly (c) manipulate or influence their own emotional states with the goal of achieving a desired mood state, e.g., happiness, excitement, and sadness. Now as soon as you put it like that, some of the problems we’re facing starting to become clearer. Let me give you an example. For this purpose, I decided to go to a normal large-city orchestra and check out their website. The Cleveland Orchestra seemed a good enough example. 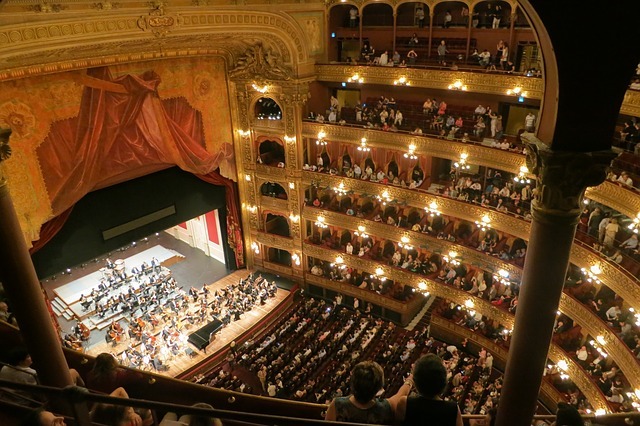 I then didn’t have to look too far before I found the following concert, which is a great example of the typical sort of classical concert program that symphony orchestras perform around the world. So it will be a program that will please some people overall, but there will be a part of the crowd that only likes bits of it. What does that have to do with Purpose? We could get into an endless debate about the merit of the works being performed. But let’s ask a more fundamental question: why are those four pieces in the same concert? Looking at it, what would you say is the artistic reason for presenting those pieces on the same night? Music that makes me happy. Music that I am familiar with. Grand, triumphant music that makes me feel ecstatic. There are all sorts of reasons and we could make a massive list. But can you start to see the problem? The composer or conductor might be performing the music for the serious purpose of showcasing an orchestra, i.e. the purpose is about the excellence and musicality. But someone watching the show for the feeling and the tunes, they’re not guaranteed to enjoy the experience. Some music which is phenomenal in terms of its composition and musicality can be difficult to appreciate if all you’re after is big tunes and sweeping emotions. Likewise, there is plenty of music out there that listeners might consider great tunes or emotional mood lifters, which are exceedingly dull to perform and bland in terms of their composition and structure. In short, we can have a mismatch of purpose. To put it in the same categories of reference as the Psychology Today artilcle, it’s possible that a particular concert experience might be crafted more along the lines of the Intellectual Curiosity purpose, but some members of the audience might be there more for the Manipulating/Influencing Emotions purpose. The end result: you have a certain segment of your audience that doesn’t fully appreciate what you are doing. None of this is a value judgment about either the musicians’ reasons for performing or the audience’s purposes in listening. None of them are inherently bad reasons. But in conversation we know there is the concept of ‘talking at cross purposes’. I think that can happen in the performing / listening realm as well. And this can be causing problems with people who like coming to hear an orchestra. Imagine what might be going on with people out there who don’t even like classical music at all? The purposes of the audience in listening to classical music in the first place. The purposes of a classical music organisation in presenting certain music in the way it does. In the next post, I’ll continue on the topic of Purpose and look at the subtle shift in Purpose that has taken place over the last century. I’ll throw out some ideas on how we could use Purpose as a way of categorising audiences. And also – seeing as these posts are about wild theories: could we use the concept of Purpose to attract new audiences?